There is a major new event in the African calendar. On Friday, the 27th of May in Lagos, Children will be introduced to a fun new way of learning as the ‘Children’s Fiesta’ is unveiled. The event tagged ‘Children’s Fiesta 2011’ is an annual event kicking off this year with the theme ‘’Taking Tomorrow Today’’, specifically designed to inspire kids as well as enhance their career development skills for the future in a subtle and fun-filled environment. ‘The Children’s Fiesta 2011’ is proudly presented by the pair of The Queens of Africa Project and Silverbird Communications. Entrepreneur and Founder of the Queens of Africa Project, Taofick Okoya, describes Queens of Africa as more than just fashion dolls but an avenue “...to show African children that ‘black is beautiful’ by enabling them to play with dolls that reflect their culture and heritage”. Each doll represents a different tribe of Africa; There is Nneka (Igbo), Azeehah (Hausa) and Wuraola (Yoruba), and they are sold in various outfits, the most popular being those dressed in traditional attire. Okoya comments that “The Queens of Africa dolls were created to inspire and influence the coming generation, especially the ‘Girl Child’, so in designing the dolls and their outfits, the team bore this in mind.” He adds that “To the vast majority of people, toys are mere play items or pacifiers for children and little thought goes into which toys best serve the purpose as a tool for a child's development. Children mentally absorb positive and negative influences which can later be detected in their character, especially in their teenage years. We need to see toys for what they really are…..A fun developmental tool.” He felt it was critical to have dolls that represent African heritage so the Queens of Africa program was born. Both Companies have the support of an impressive ‘Who’s Who’ list of Nigerian Artistes and Celebrities, many of whom are set to take part in the Children’s Fiesta event. This grand event will hold at the Silverbird premises in Lekki, and will be broadcast live. The event will have about a hundred children in attendance, and guests will be selected through invites sent out to various schools within Lagos State, and also through tickets won over the radio. The event will also coincide with the launch of the Queens of Africa books based on the Queens of Africa dolls that are already familiar to Nigerian children. According to Okoya, the role of the books is the first step to taking the Queens of Africa project global. Okoya is passionate about giving young black children a strong start in life including making sure that the toys, music and books given to them convey positive messages about their heritage. His team worked with a British children’s writer and NLP (Neuro Linguistic programming) specialist, Judy Bartkowiak (JudyBee) and Yetis (LittlePinkPebble), a Children’s Illustrator from Singapore, and the first is titled ‘Learn Confidence’ as this was the first life skill that Okoya and Bartkowiak identified as being required amongst young Nigerian girls. On 27th May, the first seven books will be available in more than a dozen countries and in many formats from paperbacks, Amazon Kindle and Kobo Books through to iBooks for the iPad. 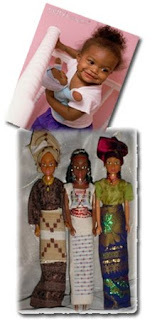 At the moment the dolls are sold all over Nigeria in major toy store chains (like Game, Shoprite, Park ‘N’ Shop and Silverbird Galleria), but they have not been launched in Europe or the USA, yet. The Queens of Africa books are available for pre-order from all good bookstores including Amazon UK, USA, Germany, France, Canada and Japan, Amazon Kindle and other formats. The Silverbird Group was founded by Ben Murray Bruce in 1980 and has grown to a diverse holding of Radio, TV, beauty Pageant sponsor, and movie distribution via its Cinema holdings in Nigeria, Ghana, Zambia, and Kenya. The group is credited for bringing back Cinema to Lagos in 2004, and establishing Ghana’s first-ever Cineplex of five theatres fully equipped to international standards and with Dolby digital surround sound and contiguous with a media store. HI. is the event strictly by iv? if not y all de ong talk without a venue? Please visit www.queensofafrica.com or call 08098552295 for further information.